Like Lesson 1, this class builds on components – specifically, the Leaf Link component. Dale shows several examples of the leaf link component in action, including a bracelet, ring, and chain. This design could be a leaf, an evil eye, or even a hidden leaf – as many uses as you can think of, this link will meet them all! 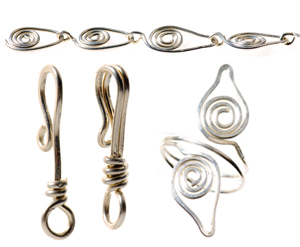 In this lesson, Dale teaches two different kinds of hooks for clasps, a chain design you can use as a bracelet, anklet, or necklace, and a brand-new ring design, all using this versatile jewelry component! You can even add findings to create matching earrings. 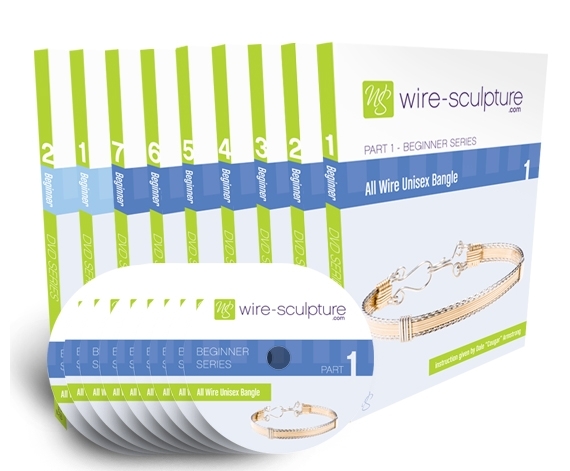 These projects only require round wire, so this is a very easy-to-make set of designs! Plus, Dale usually uses half hard wire for her designs, so this is a neat example of a dead soft temper wire design. Plus, she’ll show you how to work this wire with no nicks or marks from the pliers. You don’t want to miss this simple, versatile component lesson! I enjoy the videos and always purchase the DVD’s for each. However, this is the first lesson I could print directions for. Would like them for my previous purchase of Lessons 3 & 4. I definitely think that I need more practice here. Love the leaf component. My ring turned out wonky but that is half the fun of designing. My double hook was a big yuck, I felt like I needed three hands. There are instructions at the bottom of the materials list, only thing missing from my kit was the sunshine cloth. I too ordered DVD to go back later, and sadly still am waiting. I actually ran out of time after ordering these classes, so trying to reaccess was more difficult. My video keeps stalling out no matter what I do on my high speed connection. Dale you said there were written instructions. I orders all six lessons and the supply kits but I did not recieve any written instructions other than my notes. I am going to have to work on my ring I bent the leaf the wrong way and the leaf is stary to spread out and in correcting it it snapped. I still am giong to get it done. Maybe you can use the broken leaf as an earring? I have made several of the double wrapped hooks and the look fine untill I startand finish wrapping the bottom loop. I can’t figure out why I don’t have enough wire to do a double or tripple wrap and I have even added an extra 1/4 inch to the bottom part (5 1/4 inches) and it still does not look right. I think that a silver and copper leaf bracelet will look really nice and maybe on gold leaf in the center for a fall bracelet. I have enjoyed these classes and am looking forward to getting a bail pliers and the master set of tools as well as more wire.